46 Comments This post may contain affiliate links. 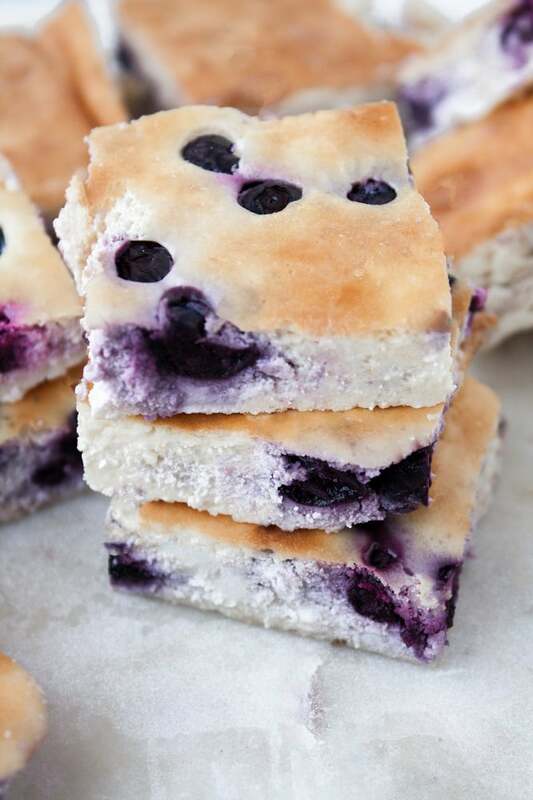 These Low-Carb Blueberry Cheesecake Bars are creamy, tart, and delicious! Plus, they are easy to whip together and will instantly satisfy your sweet tooth! Between preparing the crust and the filling, most cheesecake recipes involve multiple steps. 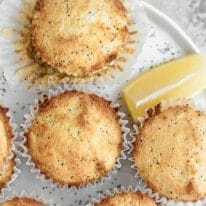 Since I know that not everyone has all day to stay in the kitchen working on a dessert recipe, I decided to develop a crustless cheesecake recipe, reducing the amount of time to prepare this dish, as well as the amount of ingredients. 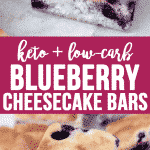 Additionally, by making these Low-Carb Blueberry Cheesecake Bars crustless, the carbohydrate content was significantly reduced! Berries are one of the few fruits that are low enough in net carbohydrates to be included in a ketogenic diet. When I grocery shop, I typically buy several pints of a variety of berries and love using them in baked goods. 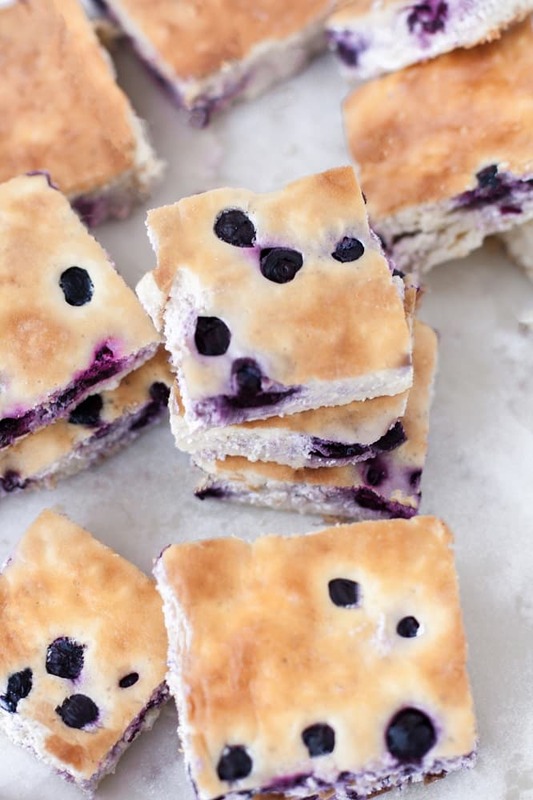 In this recipe, fresh blueberries are used, but it would also taste absolutely delicious with raspberries or blackberries! 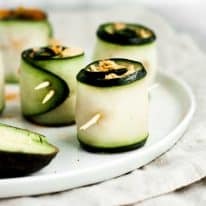 This recipe is useful to keep on-hand for those who do not eat grains, follow a keto, low-carb diet, and/or are vegetarian. Keto and Low-Carb: One bar contains 3 grams of net carbs per serving. 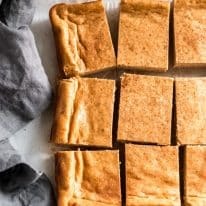 Nut-Free: These Cheesecake Bars are free from nuts and are a perfect dessert option for those who have a nut allergy or intolerance. Gluten-Free and Grain-Free: This recipe is both gluten-free and grain-free. Vegetarian: These bars will fit perfectly into a vegetarian diet. One bar contains 3 grams net carbs per serving. 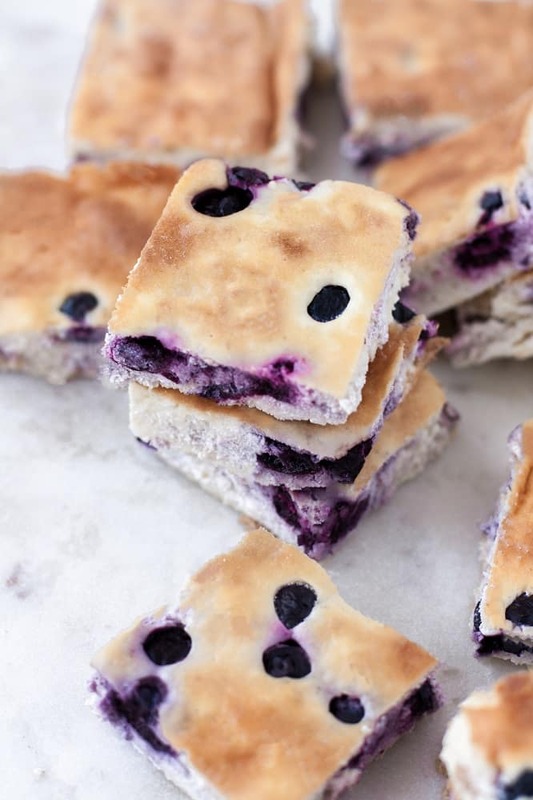 These Low-Carb Blueberry Cheesecake Bars are low-carb, keto, nut-free, gluten-free, grain-free, vegetarian, and refined-sugar-free. 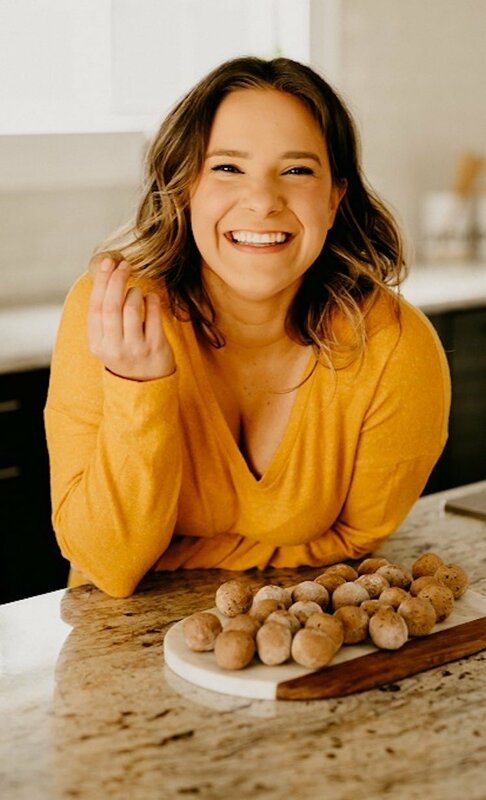 Explore more Real Balanced dessert recipes! 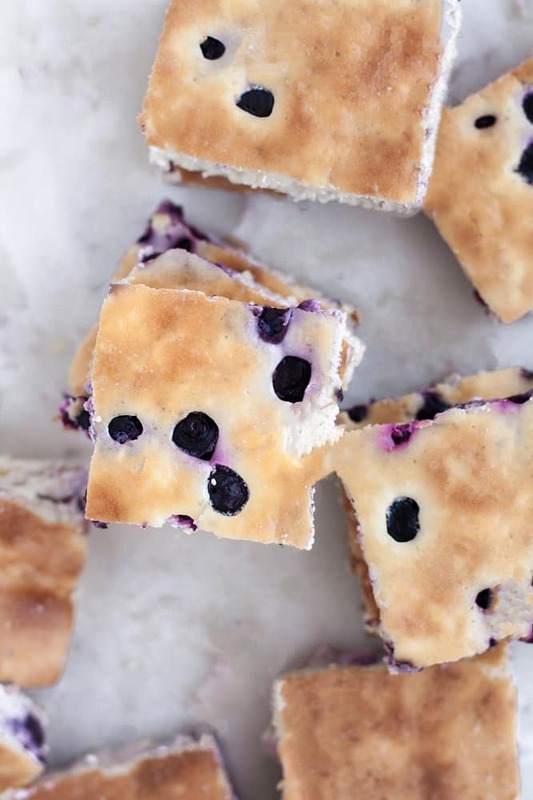 These Low-Carb Blueberry Cheesecake Bars are a deliciously tart dessert to satisfy your sweet tooth! These bars are low-carb, keto, nut-free, gluten-free, grain-free, vegetarian, refined-sugar-free, and contain only 3g net carbs per serving! Preheat oven to 325 degrees and spray 8×8 baking pan with nonstick cooking spray. In a medium bowl, using an electric mixer, mix together all ingredients excluding blueberries until fully-incorporated. Pour mixture into prepared baking pan. Place blueberries on top of mixture. Remove pan from oven, loosely cover with foil, and transfer to refrigerator to chill for at least 4 hours. Cut into 12 equal bars, remove from pan using a spatula, serve, and enjoy! Hi there! I’m contemplating making this recipe, but I’m unsure about the baking soda. Should this be baking powder instead? We’re experiencing some site troubles, but I think it’s fixed now! Sorry about that!